This is everything my sister and I bought at Renegade Chicago, September 2017. 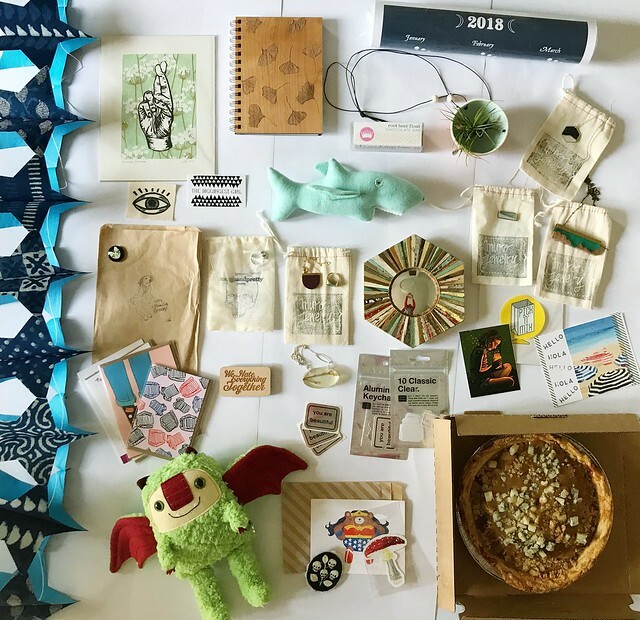 What’s funny is that I haven’t allowed myself to take any of my items (pie aside) out of the bag I have everything in, in my studio, until I do this post. I didn’t want to lose track of all of the business cards, so I could link back to everything. Plus there are a few things in here that are gifts for other people and I didn’t want to spoil any of them. We had a pretty good haul this year and I was happy to see a lot of new shops as well as a more indie feel overall. 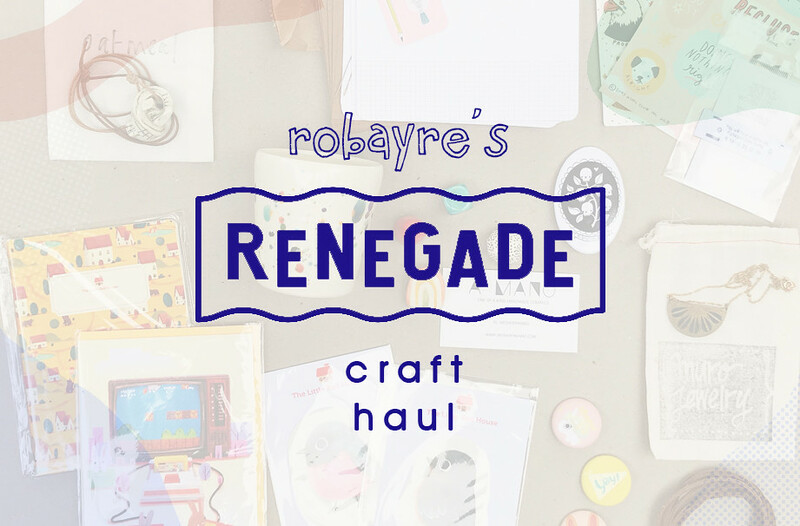 I have been feeling more and more lately that Renegade was getting to be so big and so polished that it was turning commercial, and should no longer be called a craft show. You’d see booths for actual brick and mortar stores and to me, that’s not in the spirit of Renegade. Things that were popular this year seemed to be a lot of soap (and maybe candle?) 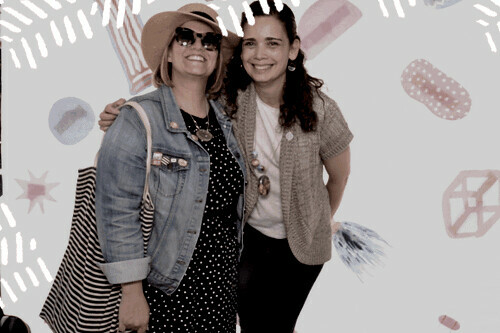 booths, enamel pins and patches, ceramics, linen and fabric scarves, a lot of character and quote references to tv shows (Park and Rec, Broad City, etc.). There were a lot more stationers there than I ever remember seeing before, which made me so happy. 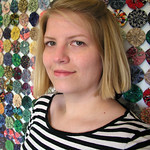 I also noticed a lot of chunky beaded necklaces (mostly made from fimo) similar to the ones I make from paper clay. There were a few space, celestial, moon things, but we were surprised overall that there weren’t tons of eclipse things. Also, I didn’t notice it at the time, but searching for the origami banner maker made me realize there were SO many makers with hand dyed fabrics. BUT, the most important part of Renegade this year was not the booths, or the weather, or the things we brought home, but rather, who we went to see. 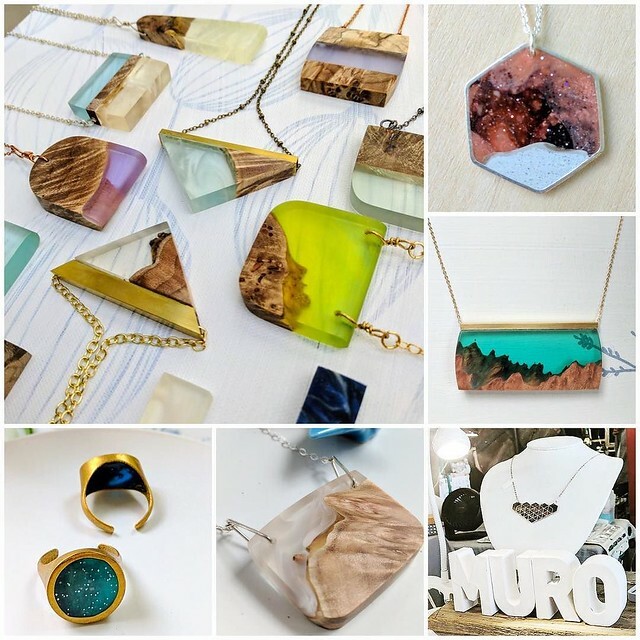 Muro Jewelry was selling for the first time at Renegade Chicago and that meant I would finally be meeting my dear friend Rosa Murillo for the very first time in real life. We have been friends for over 10 years, ever since Rosa reached out to me. She thought I might be interested in her Found Art Tuesday project, and I was, and we’ve been friends ever since. Here’s a video above, that I caught of Rosa and her husband Ruben in their booth on the first day of the fair. I was just about to type that I somehow wasn’t nervous meeting her and then I remembered reality, lol. As I got closer and closer to her booth my heart was pounding out of my chest. When I hugged her I thought she’d feel me shaking. (You may have guessed I have a little bit of social anxiety, lol). After that though, everything was good. We’ve skyped, face-timed and talked on the phone before so I knew what to expect. Side story: I loathe talking on the phone, so for the longest time Rosa used to call me and leave me voicemail messages because she knew that I would never answer, lol. Rosa was able to let Ruben take over the booth for a while, and she joined us to shop the show. I knew right away we had to make our way to the photobooth. It’s an annual tradition! I own so much of her jewelry, from the past, to what has evolved into her current body of breathtaking work. It was so fun to see a whole booth of her jewelry, and so hard to pick and choose what I was going to walk away with. She gave me a branch necklace for my birthday, and I purchased a necklace and ring. I made her one of my chunky beaded necklaces, you can see below. She put it on right away, which was kind of embarrassing because I like to think of my necklaces looking like a giant kindergartner made them, so I feel like it stuck out next to all of her grown up “adult jewelry”. Later she told me that someone asked if she sold necklaces like the one she was wearing and how I needed to make more and sell, sell, sell them! At first I was flattered, but then I wondered if it might have been questionable “the same person that made this luxurious work, also made that? !” lol. 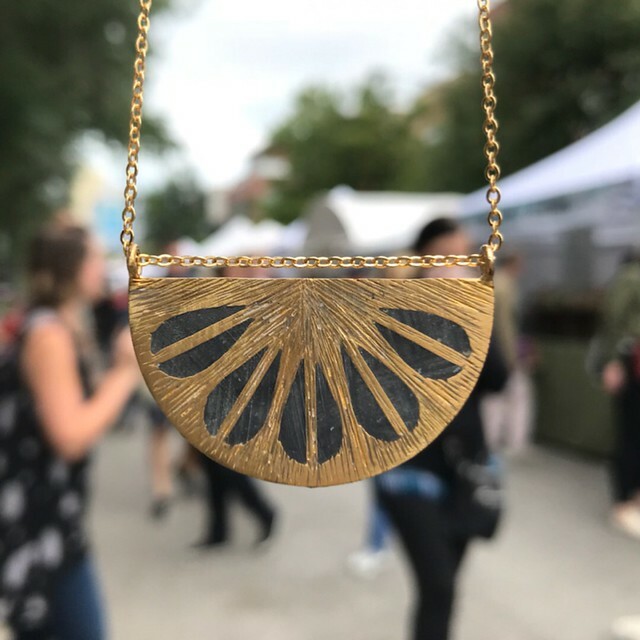 I’m not trying to bash my work, I love my necklaces, but they are definitely a bit more niche, than jewelry you would find at a jewelry store. 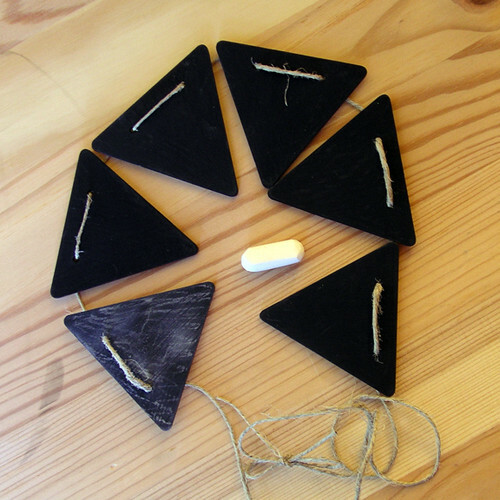 And clearly similar necklaces were being sold at many booths at Renegade, as I mentioned above. 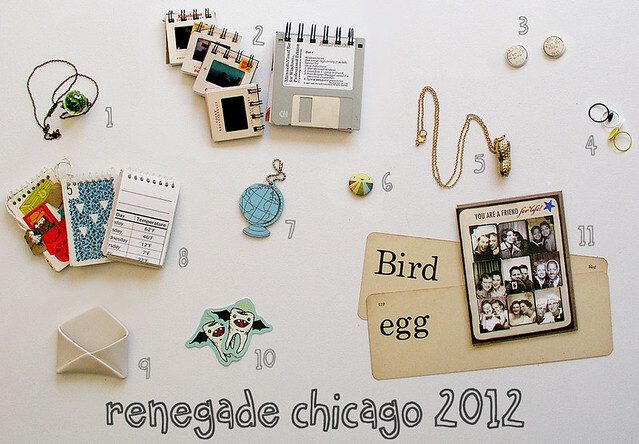 Rosa has done several Renegades across the country, but never the original… Chicago. I’ve been trying to get her to come for ages. It really is the largest of all of the fests they do! Chicago did not disappoint. 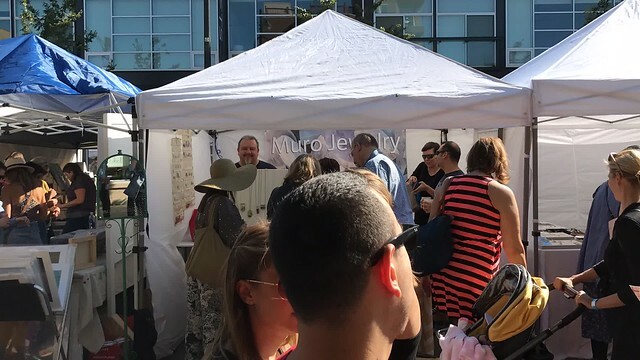 Muro Jewelry did amazingly well, and they ran out of business cards and bags early Sunday. 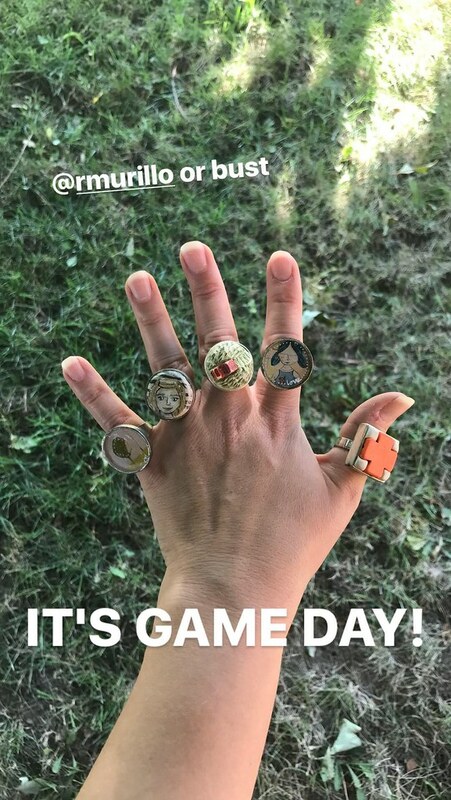 She also brought enough jewelry to probably sell at (what she thought would be 2 shows) as well as enough for another event that they were hitting up on the way home. Turns out they barely scraped by! Chicago LOVES Muro! She has already decided to come back for the Winter show (which I’ve never been to before). 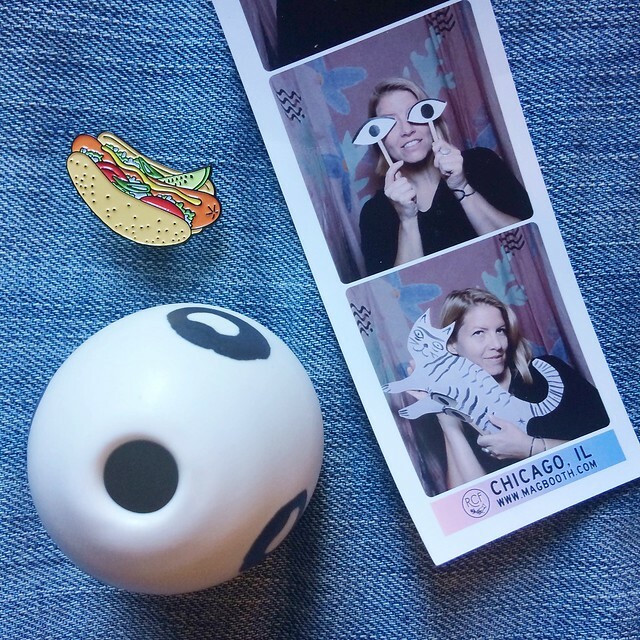 And if all of this wasn’t enough… I’ll have another post coming because… right before Renegade I entered an instagram loop giveaway, where I had to follow a bunch of shops that would be at the show, and as we were leaving Chicago that day I got an alert that I had WON! I got a huge box of loot that I also haven’t allowed myself to use any of the items yet either, so stay tuned for that. Oh, and I can’t forget the link to past Renegade Haul posts. So much for weekly updates on my 100 day project. I’m still chugging away, but am in the home stretch. More on that later. 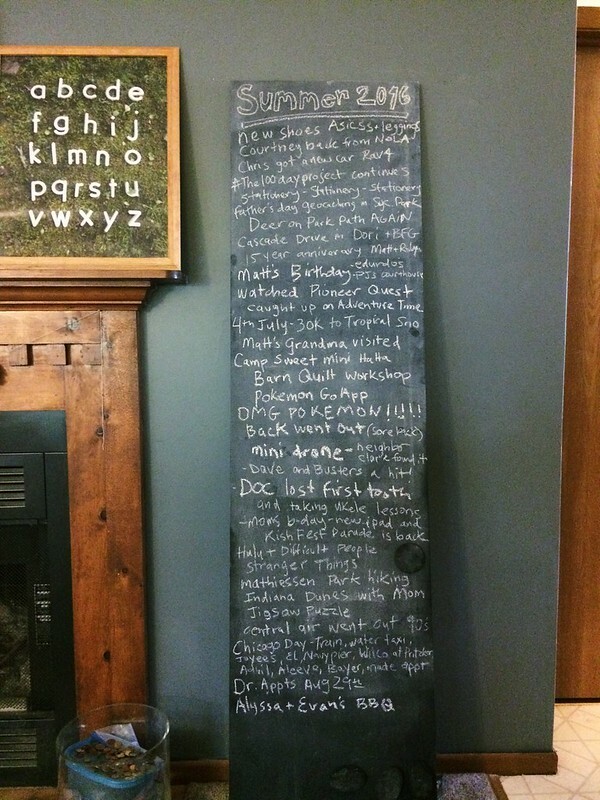 In the meantime, I’m here to share my summer chalkboard, and my annual Renegade haul. Hold on, it’s about to get real. Reflecting on this list, the summer was overall a pretty great and adventure filled one. Highlights include a trip to the Dunes, Mathiessen, starting a monthly dinner adventure with Matt’s family (for my month I went to Dave and Busters for the first time), and a trip walking our feet off all over Chicago (chinatown, navy pier, and Wilco at Pritzker and taking the train home). Sadly, I also had a cloud hanging over me for half the summer. I somehow threw out my back just walking down the block, which led to me spiraling out with hypochondria where I wasn’t sleeping, had all consuming thoughts that there was something much bigger and worse than a thrown out back, and pretty much crying every day. Thank God for Matt, and prayer. I think hypochondria has a funny-haha, rep, but what I had this summer was no joke. I feel like it’s mostly to blame for me not wrapping up the 100 day project and working more towards larger goals. And while others may not have noticed, it kept me from fully enjoying many of the otherwise good times over the summer. After a bunch of Dr. Appts., that aren’t quite through yet, I’m through the woods for now. This is, HANDS DOWN, my smallest haul I’ve ever had! I bought 3 things, THREE! A Chicago dog enamel pin from The Found (that I’ve had bookmarked on my wishlist for a long time), a tiny ceramic bud vase, and I went in halfsies with my sister on a caramel, pear and blue cheese pie from Justice Of the Pies. It’s sad when you bring a wad of cash, and you are ready to drop it at this event that you look forward to all year long. I was overall unimpressed with the booths. Of course, many of the good standbys were present, my old favorites, but I’ve already purchased things (sometimes, many things, multiple times) from them in the past. The new to me booths just did nothing for me. In fact, I realized when I got home that I had only picked up 2 business cards the whole time I was there. Normally I come come home with a dozen or more, from business that I want to look up later, and possibly shop from online. The things that I love and look out for at Renegade, are often real grass rootsy, hand made-y in the truest sense, DIY passion projects. It is a “craft show” after all. What I saw was a lot of instead was very professional, super polished small businesses with refined, almost gallery like booths and displays. When the items in your tent look like they could and may be purchased in high end jewelry or furniture stores, it kinda loses something for me. If I wanted to shop in those kinds of stores, I’d do just that! Later I did find several booths literally already have store fronts, not just items in stores, but own brick and mortar shops for their products. 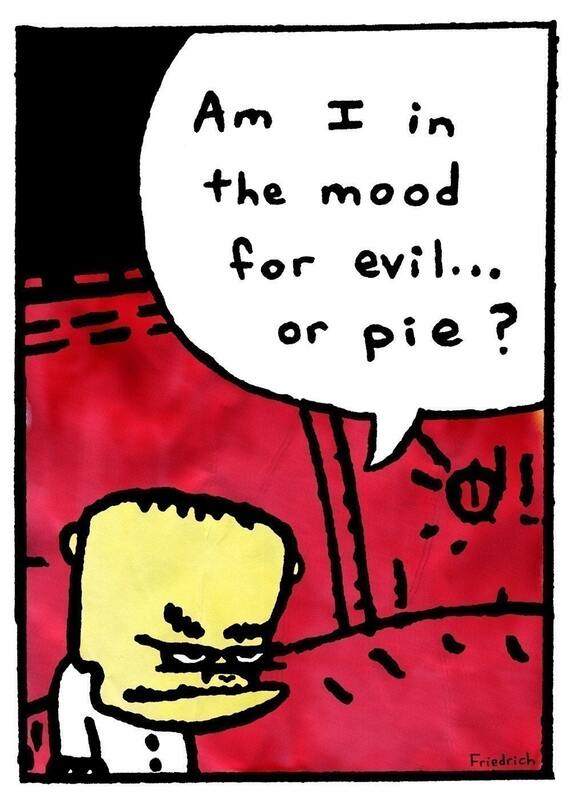 There’s also something kind of intimidating about entering a small booth, when things are so fancy that you are afraid all the products are well out of your price range, and you are afraid there is judging going on from the booth attendants that you are not one of their “target customers”. We’ve been going to Renegade for over 10 years and the DIY and Indie movement has been going strong that whole time, BUT it’s growing up. Should I be sad when someone makes the leap of passion project to going BIG TIME? Of course not, I should be, and often am, happy for their success. 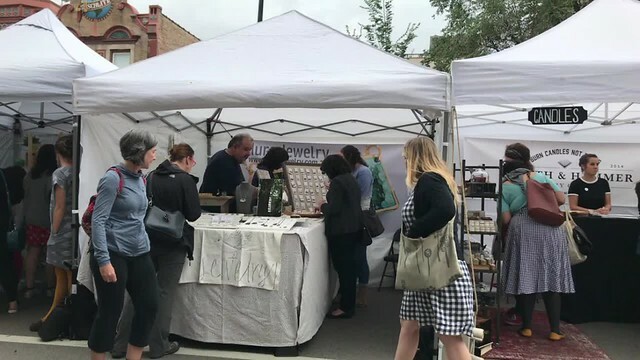 But I guess I’m just wondering, for a booth at a craft show, is it really required to make your brand so “sophisticated” that the aesthetic matches the looks of big commercial and mass produced aesthetic, that you lose all originality and uniqueness? AND, even if the displays, logos and overall atmosphere of an indie “booth” are refined, does it mean that your products also have that same look and are no longer edgy or pushing the envelope, but instead just pretty generic and safe? Where are all of the imperfections? I love the imperfections! Maybe it comes down to what the “masses” want. I know I’m not like most people. I don’t watch the Bachelor, or Housewives, I don’t care what Kim or Yeezy are wearing or saying, I don’t want everything I purchase to sparkle, but it seems I’m in the minority. Maybe the small businesses that are having the most success might be the ones who are churning out the most easily digestible products and produce work that the masses want? OR is the general commercial consensus leaning more towards the indie aesthetic? What are your thoughts? I put my sister’s and my loot together for one picture and I really should have photographed them separately. We covered the ping pong table, and standing up on a chair, the ceiling wasn’t high enough to really get a picture and then I lost detail, being so far away. Lesson learned. I’ll start top left corner and move clockwise and spiral in. -Wrapping paper from La Familia Green. One paper is a pressed penny pattern and I collect pressed pennies, and the other is a cat pattern. They also had a food truck pattern that I was tempted by, but their deal was for 2 wrapping papers, so I just got the two. Backstory on this paper was that I bought it and they wrapped it up all nicely, handed it to me in a paper bag with handles, and apparently the tall rolls must have fallen out of my bag almost immediately. I went back to the booth hoping maybe someone had returned it to them, but they hadn’t, and the, they gave me 2 new ones, which was so kind that it made me tear up. I feel indebted to them for their generosity. –Migration Goods cat ornament (with tongue sticking out. My sister bought a little Nope bunny plaque and some barrettes for our niece. It was very nice to meet Eling after having followed her online for years, probably first through flickr back in the day. –Genevieve Santos bookmarks, sticker and buttons. I was excited by everything in this booth, especially after I discovered that I was familiar with her work. I recognized a card she was selling as one I had purchased on Paperwoven, when I was researching the site and if I’d like to try and sell my own cards there. Everything she does is beautiful and super cute! How could I not buy that sticker above with the girl drinking bubble tea? -We both chipped in to buy these brilliant Pon pushpin paper clips, that I remembered from their kickstarter. They allow you to hang prints and things in boards and walls without damaging the artwork. 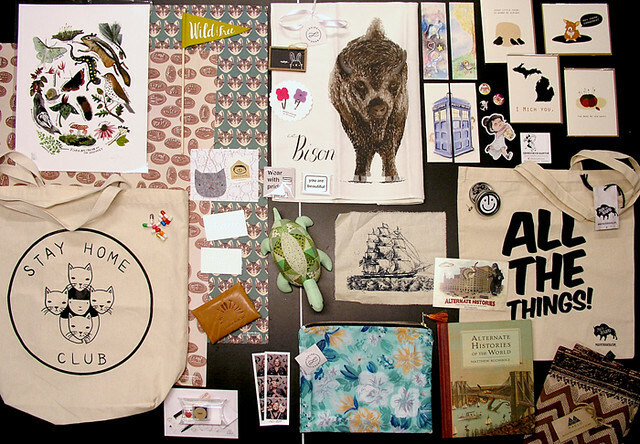 -My sister bought the watercolor patterned zipper pouch from Louise Dean, the same artist who made the bison towel above. -I got my annual photobooth picture taken from magbooth. So glad my sister saw it because last year I missed it. -I bought a stamp ring from Matters of Delight. I’ve been wanting a ring with a stamp on it for a long time. You see little kids toy stamp rings all the time, but I was wanting something a little more adult. But just a little bit, ya know ;) it says yay! and I love it! -Another birthday gift was the Stay Home Club bag which I’ve been wanting for years and years. I think I first found out about them via Katie at Skunkboy and love everything they put out. 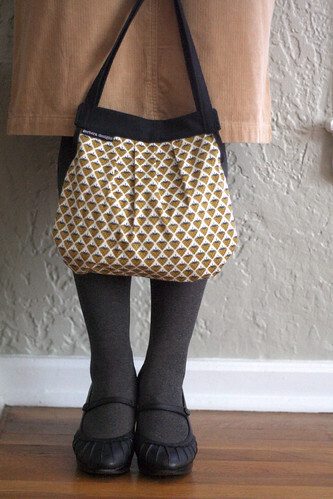 Side note: because I am constantly fighting contradictions within myself, I said I need to buy the Oh Darling Let’s Be Adventurers Bag and sew them together into one bag. -At Oh Hello Friend, I bought a bunch of little pill capsules with smiley faces and rolled up notepaper inside. I thought they would be perfect for putting in geocaches and sending to friends. I also bought a few gold letterpressed business cards with friendly greetings. -I purchased some You Are Beautiful stickers AND an enamel pin that looks like their stickers. -My sister bought an super adorable quilted turtle plush. 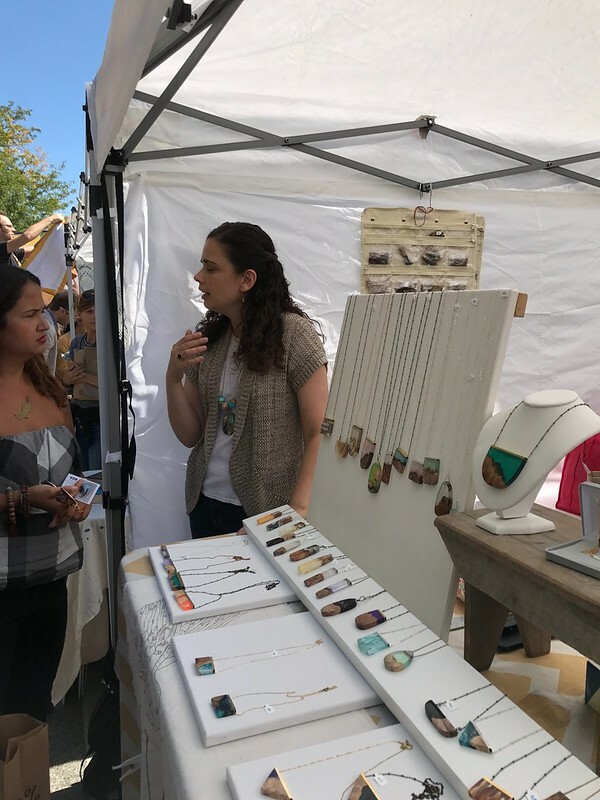 It was such a good day, beautiful weather, the people were all nice, I got such great treasures and found out about so many new, great makers. I could have easily spent twice as much! We were saying how some years the vendors will be a lot of repeats of very similar products, but this year there was a really great variety and lots of new booths that haven’t been there before. As promised, here is a loot/haul post from my trip to Renegade Chicago this year. Don’t miss the video of the fair at the bottom. 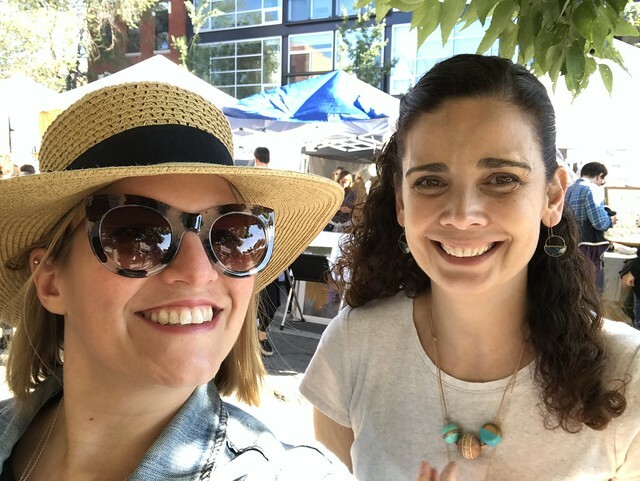 While assembling this post I went back to properly tag all my Renegade posts and realize that our trips to this fair predate my blog here, which goes back to 2006. I don’t think we went to the very first RCF (2003) but I think we made it to the 2nd one. For several years it was in Wicker Park, yes, the actual park, before it combined with the Division Street Festival. I feel like if there was a Division Street Festival before, it might have gotten overshadowed completely by the RCF now. It was also really cool, looking through old posts and seeing everything that I had purchased over the years and how the most of those items are still very much part of my life to this day. That idea, combined with my experience shopping this year, I realize that even though I spend a bunch each year, I’m not buying blindly or aimlessly. I only buy what I REALLY LOVE. As exampled in stack A.
I usually collect tons of business cards each year, and this year was no different. There are always so many booths that I walk into and fall in love with their products, only to discover that there isn’t one particular piece that speaks to me. I’ll pick up the cards to keep a tab on their online shop and hope that maybe I’ll see a piece there that I just have to have. 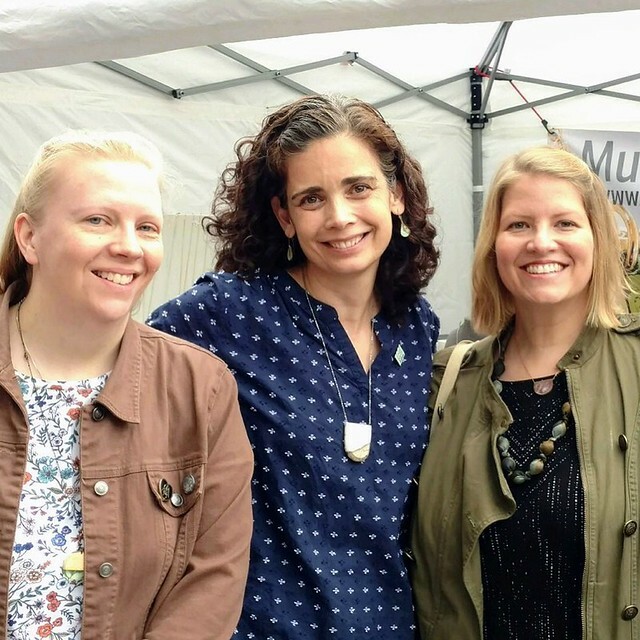 We learned fairly early on in years past that you have to go to the craft fair on a Saturday because if you go on a Sunday all the good stuff is bought up. Well, not ALL the good stuff, but the variety is no longer there. One of the booths this year, that had tons of pieces but not one piece that screamed ROBYN, was Build With Wood. 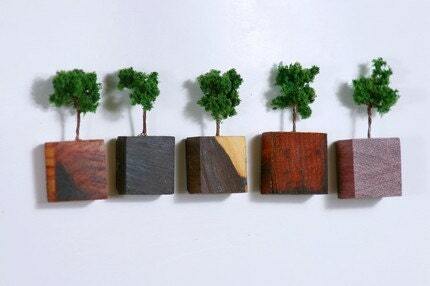 They sold wood necklaces with resin centers that hold treasures of nature, like seeds, leaves, and lichen. 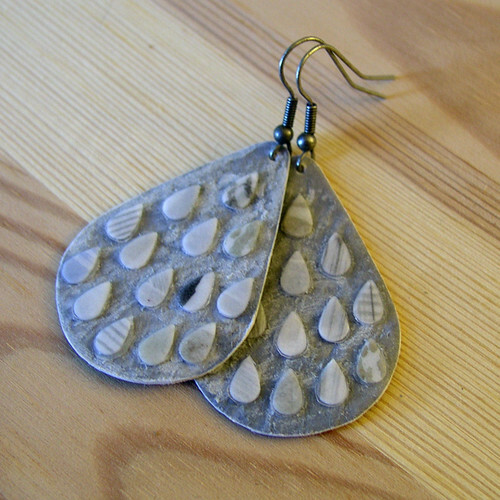 They reminded me very much of long time “Robayre Favorite” Fern Works, but instead of silver, wood. I’d really love to own my own piece from Build With Wood someday. B – Heron and Lamb necklace. This is a booth I’ve purchased from in previous years and started following on instagram. Recently she shared a new direction she was going with her work and I was really looking forward to purchasing this piece from her booth this year. C – Gnome Enterprises shirt. This is a repurchase of a beloved shirt I bought at Renegade in 2010. 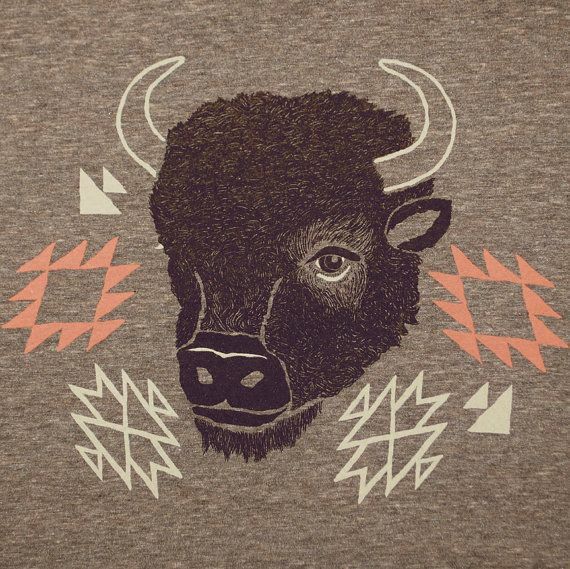 The next year I bought another shirt of theirs with an american buffalo on it. 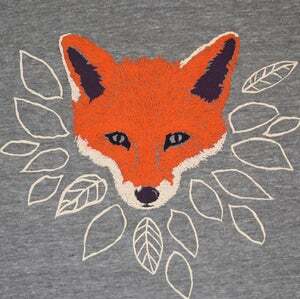 In 2012 I debated buying another one of these fox shirts because I love it so much and with as much as it is worn it will inevitably get worn out, but I didn’t push the button. Figures, because last year we didn’t see their booth at all. This year I saw their booth and jumped! Let me highly recommend their shirts, they are SO COZY AND COMFORTABLE. D – The Found I hotdog Chicago cards. I think this is a booth I’ve purchased cards from in the past. Well, I was going to buy one card which was $5 but then I saw that I could buy the set with 7 cards for $8. You do the math. 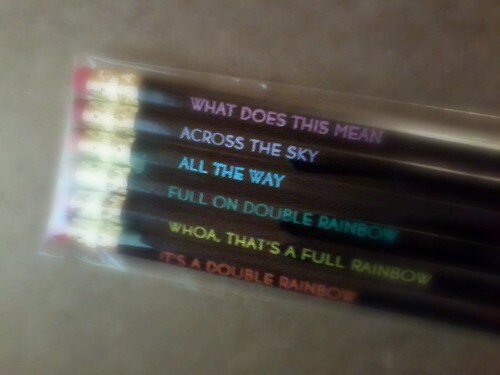 I was going to buy one for myself, but now I can send some out to people. 1. I do hotdog Chicago and 2. it reminded me of this whole trademark episode I heard on 99 Percent Invisible on PRX. E – Letter Writers Alliance – stamp. I just love this booth every year as well. I have some cancellation stamps made into buttons from them from a previous year and I just happen to be wearing a skirt that has one of those buttons on it permanently. 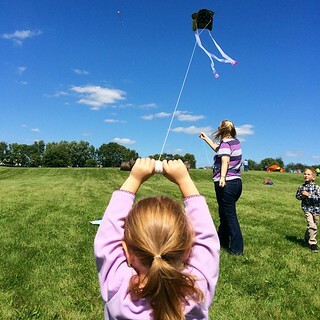 F – The Kite Collective – This beautiful kite has already been tested and flown successfully at the Kite Festival yesterday. G – Oh Hello Friend, magnet frame. It looks like a polaroid, it frames pictures, ‘nough said. H – Poppy and Fern, necklace. This is one of those booths that we’ve fawned over in past years, but couldn’t find one particular piece that was meant for me. This year I finally found one and am so happy with it, I think it deserves its own post later. I – Cardtorial, wooden cards. We actually bought 3 for a special deal. There should totally be a site “Overheard at Renegade” if there isn’t one already. I would have some great material, such as the girl who said that while she was hunting for her last apartment, almost all of the places she looked at had one of those Chicago neighborhood map posters hanging. I have one of those posters too. And then there was the NY lady in the Gnome Enterprises booth who thought she could throw her self important weight around because she had bought shirts from them in Williamsburg and the Hamptons and then she even had to call her daughter in NY to tell them “They have Gnome Enterprises in Chicago now too!” lol. I think she bought 6 shirts. Lady, they’ve been here for a long time. Looking through the roster of vendors makes me feel like I must have missed so many booths. But then I think back to a conversation I just had yesterday where I was talking about how much I struggle with displays for my own craft booths. 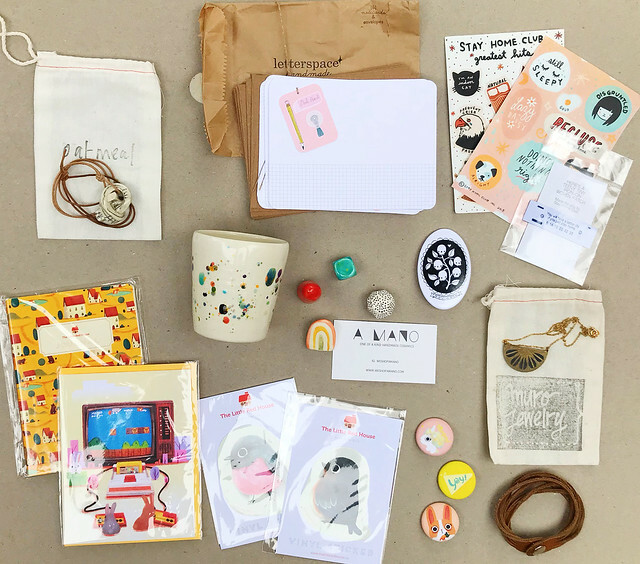 I said that because of my background being in 2D design and knowing photography, I’m much more comfortable with photographing my products and that when it comes to craft booths I just have no interest and want to simply throw all my stuff out on a table. But, I also understand the difference that a quality picture or display can make on selling. A friend had asked me to do some “research” while I was at Renegade and look at booths for creative displays. I realized quickly on that if I want to actually shop that I can’t be eyeing displays. In successful booths the displays are so great that you don’t even notice them and just focus on the products and those spectacular displays elevate the quality and price of the products compared to the exact same type of products that might just be thrown out onto a table. I used Instagram’s new app Hyperlapse to take some videos while I was at Renegade this year. I put them together with another app which added that annoying logo in the corner. Not sure how to add music yet. But this video might give you a glimpse into how big and busy Renegade is. It’s that time again! 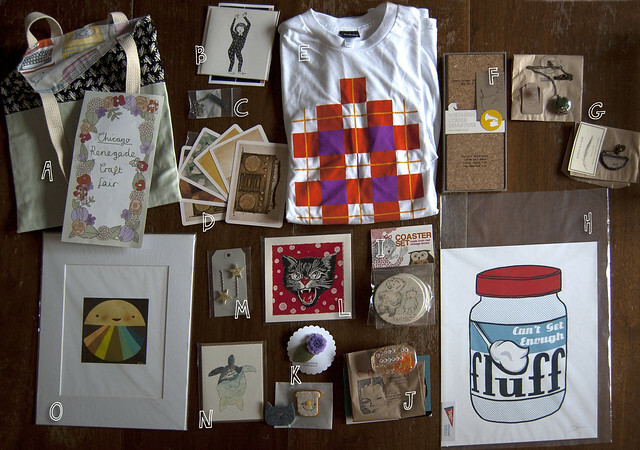 Time for the annual Renegade Craft Loot Haul. This year I decided to combine my sister and my purchases together. Items are clockwise-ish from top left. I just love attending Renegade every year. It’s like my favorite online stores put together a ginormous mall once a year and I can browse and hold tangible things in my hands and shop until my heart is content. 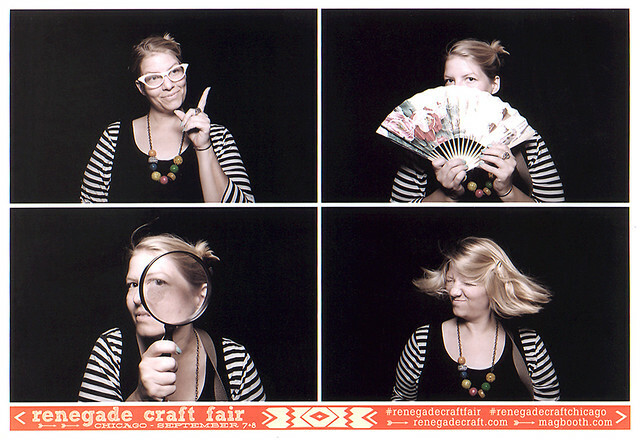 And then of course, I did the Renegade photobooth and was very pleased with the results. It’s hard to keep it fresh when they have the exact same props every year. Also, I really am thinking I need to retire this summer wardrobe. I think people are going to start wondering if I actually own any other clothes. 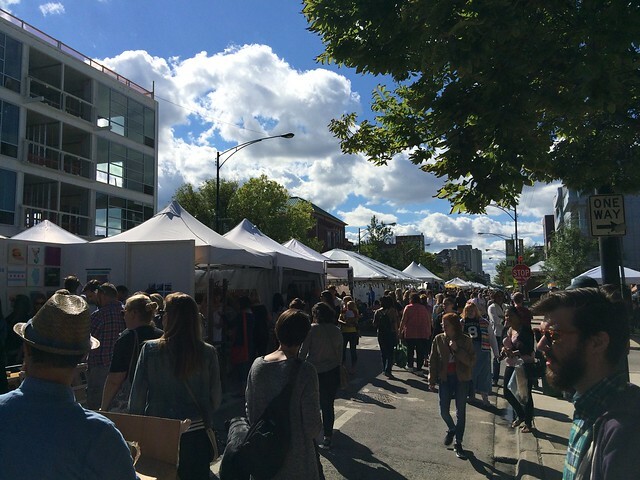 This last weekend was the 10th annual Renegade craft fair in Chicago. I think my sister and I went to their second year and have gone to every one after that. 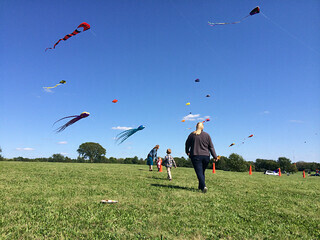 We’ve seen it all, from rain, crazy winds, to intense heat, but I think I can safely say the weather this weekend was PERFECT. There were clear skies, and it was in the comfortable 70s. 1. My favorite piece I purchased has to be this terrarium necklace by Heron & Lamb. Time for my Renegade 2011 loot post. As you can see above, I was able to hit up the photobooth again. Here’s last year’s. This year was a great success for finding goodies and a hit on my wallet, as you will see below. I dropped a few pretty pennies, but picked up some lovely treasures at the same time. Last year I bought a fox shirt from Gnome Enterprises and it is hands down the most comfortable shirt I own. Also, every time I wear it I get compliments. So, this year I had to get another and I debated getting the fox shirt again (because I LOVE it that much) but in green this time, but went with the buffalo shirt after all. It make me think of the prairie and I love me some prairie. I’ve eyed these little brooches by MigrationJewelry on Etsy before. I was glad to see them at Renegade and purchased this orange marmalade one that wasn’t smiling or frowning, but just a straight across mouth. He cracks me and I love him. I bought a half set of these “GRACIAS” letterpress cards from YeeHaw. The colors of my cards are more vibrant and less pastel-y like the ones pictured. I bought this chalkboard bunting banner from KillsideKrafts. I think I might hang it on the front door with a little greeting. 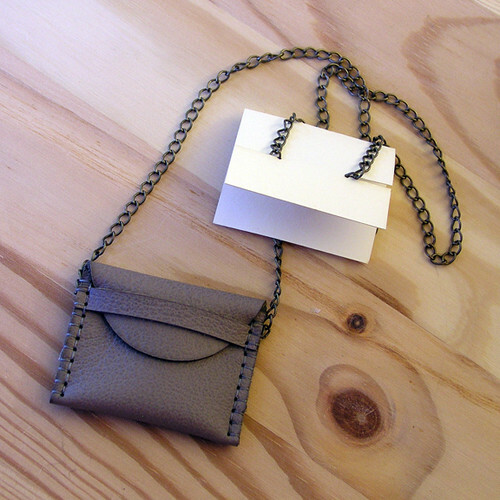 I love this little leather pouch from Romantique. Not sure what I will put inside of it just yet. Love notes, prayers or tiny treasures to keep close to my heart. It’s true, I don’t even have pierced ears, but I plan on making these earrings from Eaganaise into a necklace. 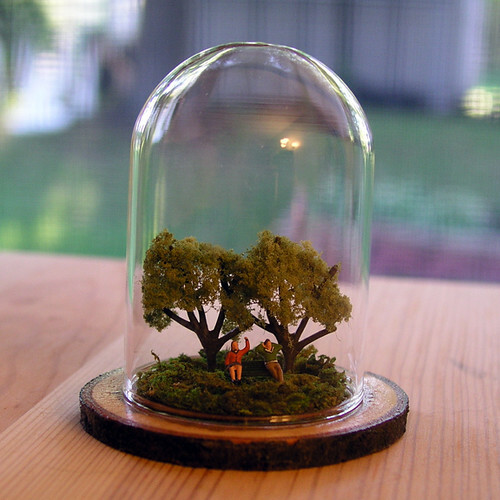 I purchased this mini terrarium from Black Forest Clockworks. It has a couple on a park bench. The man is just chilling back and the woman is fist pumping, so yeah, it’s pretty awesome. It’s already on our mantel. 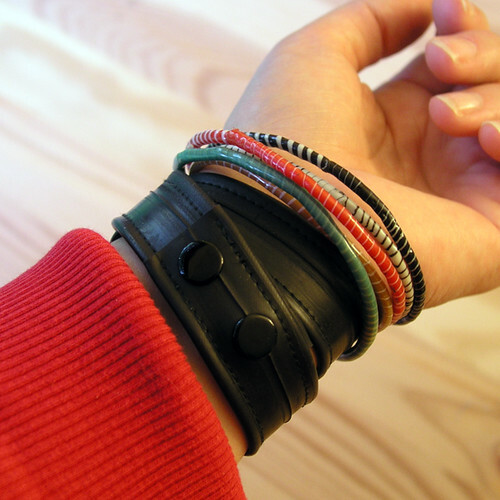 This black snap double cuff bracelet from Vert Moderne is made from recycled bicycle inner tubes and I’ve been wearing it ever since I bought it. The other bracelets I just purchased at the PaperSource and they are made from repurposed materials. 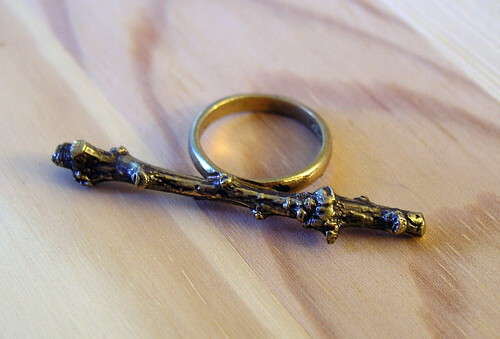 And last, but definitely not least, here is a twig ring from Species By The Thousands. This was actually the first purchase for the day. I can’t tell you how many times I’ve hunted Etsy for twig jewelry, so this was a perfect find for me. 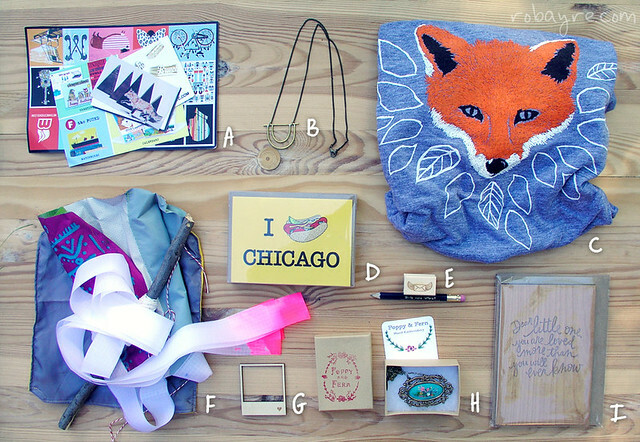 Okay, back with the last few items from my shopping spree at Renegade Chicago. See the first part here. and now, gah!!! I picked up tons of business cards, but I still have two more products that I bought, but can’t figure out who the sellers were. If you know who sold these items please leave a comment and let me know. 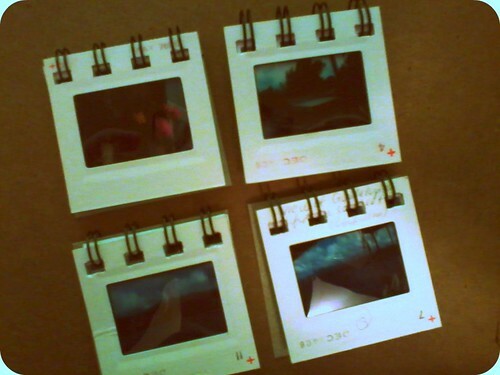 I bought a bunch of these mini projector slide books. 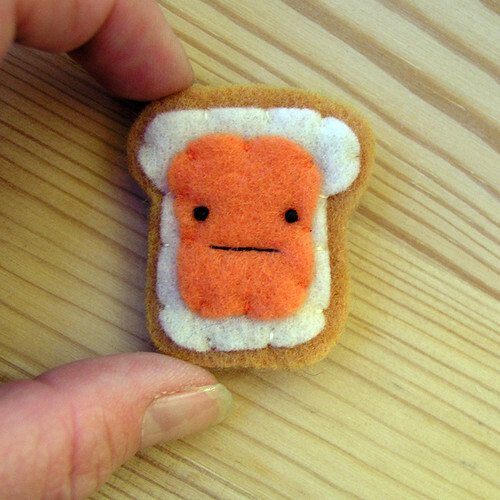 So tiny, so cute, so inexpensive at only $1 each=so irresistible to buying a ton. Okay, so that raps up Renegade for this year. Fun times. 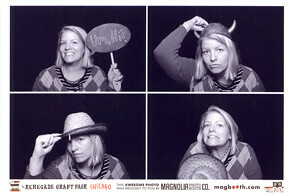 As annual tradition dictates, my sister and I hit up Renegade Chicago this weekend. Last year we went on Sunday and there were vicious, pushy crowds, while vendors were left with little variety in product. So, this year I vowed to make sure and go early. It worked. For better or worse, I dropped almost $200 bucks. 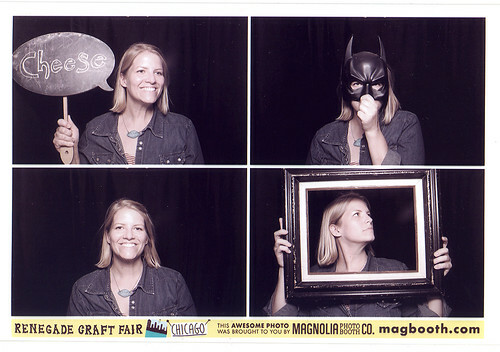 The digital photobooth, provided by Renegade. They had a suitcase of props. I can never pass up a photobooth opportunity. a couple prints from Paul Friedrich (onionhead monster). Okay, check back later for part two of the things I got at Renegade. Dinner is done and the Mr. is getting restless.